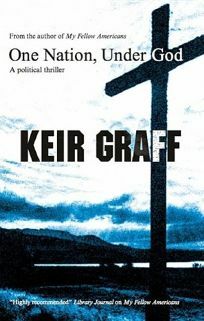 A simplistic plot line and unsophisticated characterization undermine the message of this contemporary political thriller from Graff (My Fellow Americans). After performing with Crucifer, a satanic band, recovering drug addict Seth Stevens has found a more spiritual outlet for his musical gifts with the Christian band, Salvation, in Tulsa, Okla. When a lone Mormon missionary goes missing after crossing Terry Kinsman, a member of Salvation and a youth pastor in the Free Church of God's Slaves, Stevens begins to question his new life. He's gradually drawn into the church's covert political wing by Kinsman, who's determined to defeat a Democratic U.S. Senate candidate by any means necessary. While Stevens manages to overcome the lure of his former friends from Crucifer, disentangling himself from the radicals involved in his church proves more of a challenge. A routine romantic subplot doesn't help this unconvincing fictional effort to paint the extreme religious right as a major threat.